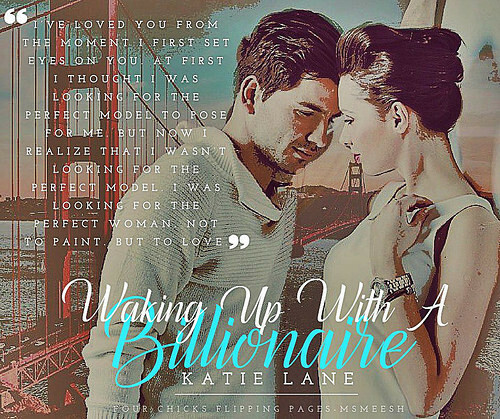 Waking Up With A Billionaire is the third installment in the Overnight Billionaires Series by Katie Lane. I have not read the previous two books, which is fine since this third installment can be read as a standalone but given the fact that I enjoyed this book, I will definitely be checking out the previous two. Oh Romeo...Oh Romeo..wherefore art thou Romeo? Well apparently, Romeo lives in San Francisco and is a broody painter and an heir to a billion dollar lingerie company alongside with his two brothers. Grayson is a well talented painter but for the past several months he has been in a funk and nothing has been inspiring lately that is until Chloe walks back into his life. Chloe waltzes back into Grayson life, willing for him to paint her body for some money but he turns her down. She was hoping that he would do it since she needs the money to leave the country. Grayson is well aware of Chloe’s abusive ex-boyfriend and so he takes her away to his house. And slowly readers begin to see layers of Chloe’s vulnerability begin to be unmasked and how safe and loved she feels with Grayson. Will Chloe discover that she doesn’t need to run away because home is with Grayson? Waking Up With A Billionaire is a sweet love story of two broken individuals with secrets who discover that painting on their own blank canvas is what they needed. And like any good painting, it’s about the color, mixture, and how you view your masterpiece that makes any painting special. And for Chloe and Grayson, their final masterpiece was a work where they both learned how to paint together and in such find their own muse, home, and happiness. So if you are looking for a story where two flawed individuals built their relationship on friendship, trust, and love then go give this book a try.